My 9-year-old daughter's mouth system seems a little underdeveloped. She was born without several adult teeth, which the orthodontist says may be a blessing because her mouth is so small. Where would they go? In fact, her adult canines have no interest in coming on down to join her front teeth because there's no room for them. So yesterday, the dentist extracted FOUR baby teeth. 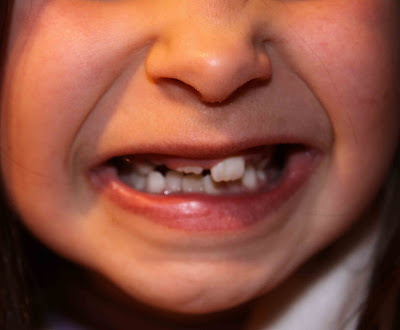 You're probably envisioning the tiny baby teeth that your children have put under their pillow for the Tooth Fairy, but her baby teeth still had full roots on them, and I just about passed out when Dr. Silverman held one up in a forcep, all bloody and huge and looking like a scene from Saw. She has a beautiful smile....at least it happened just in time for Halloween!! Ahhh, cute! She will now have room to grow those adult teeth. When I was a kid, I had a canine tooth that never came down and my orthodontist had to pull it down over time using my braces. It all worked out.